CRAZY DISCOUNT! Was: $449.95 Now: $299.97! Are you hunting for a perfect birthday or Christmas gift to surprise your kids? This eco-friendly Electric Ride on Jeep Remote Control Off Road Kids Car w/Built-in Songs - Red? with stunning exterior design will be your ultimate solution. 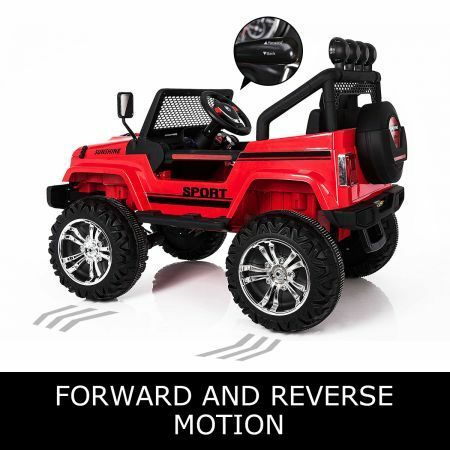 Equipped with dual opening door, battery level indicator, forward/reverse button, high/low speed button, one push start button and a rear-view mirror on each side, this ride on jeep gives your child a realistic driving experience. Four powerful motors with a broad speed range from 3 to 6km/h enables your kids to enjoy a longer-lasting ride and choose any driving style they want. No need to worry about the charging problem, because each 8-10-hour charge can support up to 2-hour ride. The parental remote-control operation of this offroad car is provided to keep your child safe. Qualify approved by CE, EMC, EN71, EN62115, ROHS.